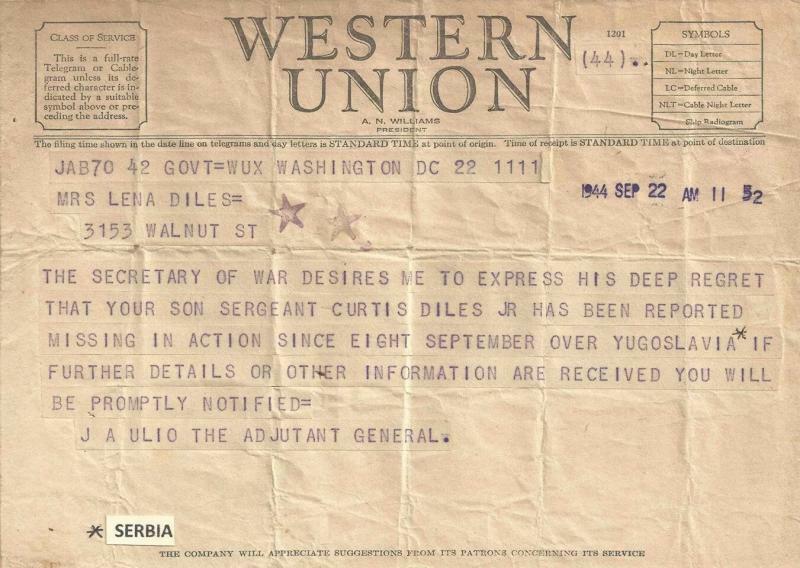 Curtis Diles was more "Serbian" than many Serbians by blood we know. To his dying day, he was grateful to General Draza Mihailovich, his Serbian Chetniks, and the Serbian people in general, for saving his life when his plane was shot down on a mission to bomb the Ploesti oil fields in Romania, that supplied more than 1/4 of the German war machines in WWII. He spoke up on all occasions, defending the Serbian people, even putting up 512 American flags on his property near Dayton, OH, to tell all visitors passing by his busy highway property, about the 512 American Airmen rescued by General Mihailovich and his Serbian Chetniks, villagers, the O.S.S. (Forerunner of today's CIA) and the 15th Air Force pilots and the Tuskegee Airmen who flew cover. Update: The name of one of the Tuskegee Airmen was recognized in the Beaver County TIMES of Thursday, September 3, 2015. It says: "Sgt. Paul Short, part of the 15th Army Air Force in Italy, was awarded a Silver Star for hleping to rescue hundreds of downed pilots in Yugoslavia is 1944." There is a plaque honoring local Tuskegee Airmen at the WWII memorial along Third Street in Beaver, PA.
"Tell people to Google my name," was one of his dying wishes. He wanted people to know what he stood for. Curtis Diles: Obituary: Listen to "America, America!" playing in the background. Curtis was a TRUE American.... with all the attributes we attribute to what makes a good American.... Loyalty, Truthfulness, Bravery-- Thy Liberty in Law! 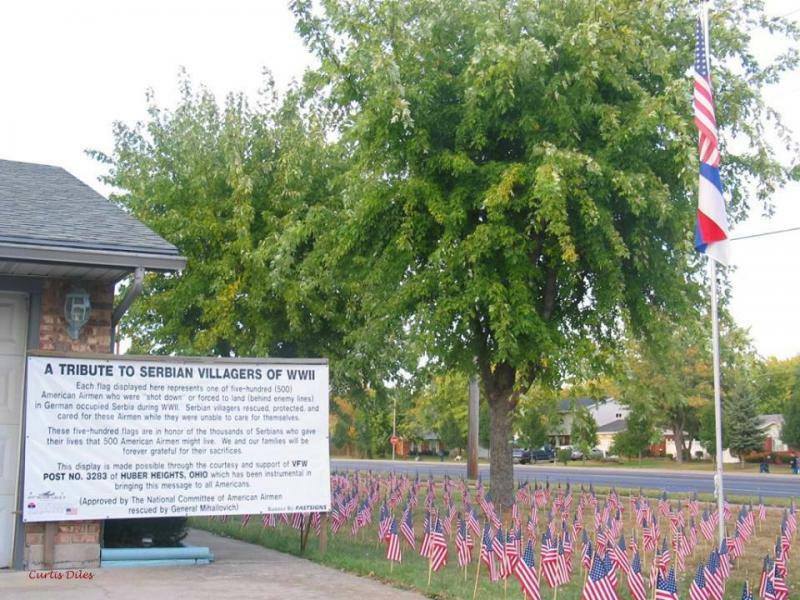 But at the funeral home, both the American and Serbian flags were on display. After the funeral, Inez Diles, Curtis' widow, passed on that flag to daughter Diane Diles Hammond, who promised to carry on her father's legacy! What a family Curtis produced! Curtis "Bud" Diles, Jr., age 89, of Huber Heights, Ohio passed away Wednesday, September 10 at Miami Valley Hospital after a long illness. He was born July 15, 1925 in New Boston, a son of the late Curtis and Lena Belford Diles, Sr. He is survived by his loving wife of 66 years, Inez L. Pruitt Diles, whom he married in Portsmouth Sept. 25, 1948; children Dennis (Bev) Diles of Chaska, Minnesota, Teresa (Jack) Guidry, Janis “Diane” (Chuck) Hammond, and Tamara (John) Meese, all of Huber Heights; 15 grandchildren; and 7 great grandchildren. He is also survived by sisters Sonja (Bill) Rice of Reynoldsburg, Deloris Walker of Minford; and brothers Paul (Sarah) of Sarasota, Florida, and Alva "Sonny" (Jean) of Chillicothe; and many nieces and nephews. He was a devoted, loving, and generous husband, father, and grandfather. His greatest treasure was his family. He delighted in sharing his great wisdom and always had an idea to improve things. He never stopped analyzing and believed that an idle mind was the devil’s workshop. He was “Mr. Fix It” and was an exemplary machinist. No doubt, he is tinkering in heaven at this moment. He was a dedicated member of the First Christian Church of Huber Heights. Although he often struggled to understand the message due to his hearing impairment, he faithfully attended “just to show whose side he was on”. As he was ushered into heaven into the loving arms of Jesus, we know exactly which side he’s on. in the Halyard Mission, but was rescued by the Serbian Chetniks lead by General Draja Mihailovich. Had it not been for Serbia, he and his descendants would not have been blessed with the gift of life. The details of this incredible rescue are documented in the book “The Forgotten 500”, by Gregory Freeman. It was his life’s mission to spread the truth to the world about the Serbians’ loyalty to America in WWII. For his service, Curt received the EAME Theater Ribbon with 1 silver star, the Air Medal with 3 oak leaf clusters, the Purple Heart, and the Good Conduct Medal. The country of Serbia also recently presented him with the Order of Karageorge's Star with Sword for 70 years of exceptional service in spreading the truth about Serbia and its WWII and post-war struggles. Rest in Peace, good and faithful servant! You were tremendous in all that you did! And we're so grateful for all you did for all of us, lo these seven decades. As the 70th Commemoration of Operation Halyard takes place on September 22, know that your name, Curtis Diles, will be said on the lips of those who will never forget you! We are also grateful that Obrad Kesic, representing Republika Srpska, was there at the funeral home to speak on behalf of all of us. Curtis is fighting the good fight, even from his grave! Look at the back of his tombstone to see the beautiful tribute to the Serbs! They are ONE very special family!!! I'll always love you Curtis, for Everything! This speaks VOLUMES for the type of man he was! May he rest in peace knowing he did his all! To his wonderful children and grandchildren! Diane Diles Hammond's son, and +Curtis's and Inez's grandson, S/Sgt. Kevin Hammond, was named Airman of the Year 2017 for his Squadron Group, and most recently, the 60th AIR MObility Wing at Travis Air Force Base! 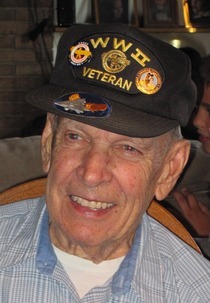 Curtis (Bud) Diles, of Huber Heights, Ohio, passed away at age 89 on Wednesday, September 10 2014. He is gone, but never will be forgotten for his great deeds. Curtis “Bud” Diles would have graduated from Portsmouth High School in 1944, but he dropped out to go to work. He was working as an automotive machinist when, two months after his 18th birthday, which came July 15, 1943, the U.S. Army drafted him. He chose the Army Air Corps. A year later, on Sept. 8, 1944, he was a nose-gunner on a B-24 Liberator, making strategic bombing missions over Europe out of southern Italy. He would fly 35 such missions before the war ended, but on this day it seemed certain the war would end for him at hardly half that many. This particular mission, his 17th, involved the bombing of a German oil field, Ploesti. The mission was accomplished, but at a terrible price. German anti-aircraft artillery and fighter planes were waiting for the lumbering bombers. Many of the B-24 crews never finished the mission. They died when their planes crashed in the mountainous Balkans of Yugoslavia. Many parachuted into the unknown and some who survived became German POWs. The 19-year-old Diles, his plane badly damaged by anti-aircraft fire, bailed out with his crew over Yugoslavia, behind enemy lines. American intelligence had warned the bomber crews that if they were shot down over Yugoslavia, to avoid the Serbs, who reportedly were collaborating with the Germans. Not true at all, says Diles. One of Diles’ crew members, the radio operator, was captured by the Germans. Diles and the other six were rescued by local villagers and members of the Serbian Chetnik Resistance Army, led by Gen. Draza Mihailovich. Back home at 3153 Walnut St. in Portsmouth, his parents, Mr. and Mrs. Curtis Diles, wrung their hands in anxiety as a war department message told them only that their son was missing in action since a flight on Sept. 8. To see this larger, click on the bottom right hand corner. The Serbs kept them hidden and fed them and, working with U.S. Intelligence forces, made arrangements that saw Diles and his crew members, along with other American fliers who had been shot down and rescued by the Serbs, picked up by an American C-47. They were back at their home base within 10 days after they were shot down. “We walked from Belgrade to the makeshift airstrip where the plane would pick us up. It must have been 150 miles though woods and over hills. We slept in a hayloft of a barn that final night. The C-47 picked us up on Sept. 17, 1944, and brought us out of there,” Diles said. He learned that it was not just his crew that Guerrilla fighters with the Serbian Chetnik ﻿Resistance Army had helped. First, they heard of 50 others, then they learned that there were hundreds of other American flyers who had bailed out of their crippled planes and were protected from the Germans by the Serbs. The United States sent in OSS agents on a daring rescue mission known as Operation Halyard. What started as a 10-day mission lasted nearly six months and the C-47s, landing one by one on a runway built by the Americans and the Serbs, brought out nearly 500 downed American flyers. “It was a covert operation. The Air Force had four or five men assigned to this shuttle service, flying from Italy to the airstrip in Serbia, picking up a load, and flying them back to Italy,” Diles said. While the rescue was taking place, Diles said, the U.S. and Great Britain abandoned Mihailovich, accusing him of collaborating with the Germans. They began backing instead communist leader Gen. Josip Tito. Diles said he and other rescued airmen felt the U.S. government didn’t give Mihailovich credit for helping them and relied on false information in turning against him. According to Diles, hundreds of American airmen who had been rescued with Mihailovich’s help were angry and devastated over not being allowed to testify on his behalf. “I have yet to hear a rational explanation as to why our government abandoned the Serbians or neglected to intervene in the trial of Mihailovich,” Diles said. At any rate, once back at their home base in southern Italy, Diles and his crew were assigned another B-24 and were soon back helping to bomb Germany into submission. “Up until that time, if you were shot down and survived, you went home, the entire crew, but I had to go back and fly some more,” he said, no doubt because the U.S. had lost so many bombers on these strategic bombing flights over Europe. He made 18 more missions. He had a few shrapnel wounds but nothing serious enough to keep him out of action. The Purple Heart is among the medals he won for his year in combat. “I believe one cluster was awarded to the medal for each 10 missions flown, something like that,” Diles said. Discharged in November 1945, Diles returned to Portsmouth to find a job and get on with his life. He married Inez Pruitt of Vanceburg, Ky., in 1948. They have lived in the Dayton area — Huber Heights — for the past 36 years. They have three daughters and a son, 15 grandchildren and five great-grandchildren. An event taking place 10 years ago in the Dayton area brought to life again those 10 days Diles and his B-24 crew members spent in the mountains of Yugoslavia with the people who saved their lives, the Serbian Chetnik Guerrilla fighters. His 12-year-old grandson, Adam Harlow, checked a book out of the school library for a class reading assignment at his junior high school. The Time-Life book, written in 1978 by Ronald Bailey, had a photograph taken Sept. 17, 1944, by Life magazine photo journalist J.B. Allin, of five American flyers sleeping in a hayloft. Harlow’s mother, Teresa, thumbing through the book, discovered the photo on page 188. Diles, then 19, was in the middle, and she recognized him immediately. She rushed to show Adam his grandfather, immortalized now in a 32-year-old Time-Life history book about World War II. The Life magazine photographer had accompanied the C-47 that flew Diles and the others to safety, and learned from the Serbs of the American flyers hidden in the barn loft. “That’s my grandpa!” Adam told his teachers and classmates, opening the book to the photograph. Diles worked for more than 31 years as an automotive machinist with Wolford Machine Shop in Portsmouth. All the time he was trying to get a job at the steel mill in New Boston (first going by Cyclops, then Empire Detroit Steel), which was the best paying job around. Finally, when he was past 50, he got on there. “They never hired anybody past 40, but the federal government had a new law about age discrimination, and they could not refuse to hire me because of my age,” Diles said. He worked there 18 months, until the mill, already on its downward spiral, closed its doors forever in 1980. “We sold our Portsmouth house, moved to Dayton, and I started life all over at past 50,” Diles said. “I have subscribed to the Portsmouth Times for more than 60 years,” he said. “I was a Times carrier in 1940-41. My route was in eastern Portsmouth and western New Boston. Curtis Diles said he did get his PHS diploma after the war. Speaking in response to his interview by a Daily Times reporter for this story, he said, “Your prompting has caused me to review the past 65 years and I find I have had a full enjoyable life with one son, three daughters, 15 grandchildren and five great-grandchildren, and still enjoy every day. He said his two years with the Army Air Force and the nine days he was in Serbia had a life-long effect on him. Thanks to Aleksandra Rebic for first posting the above story from the Portsmouth Times. Aleksandra's Note: He is one of the very last of them still living. I had the pleasure of meeting and spending time with Curtis "Bud" Diles in Chicago, in May of 1994, when he came to participate in the 50th Anniversary Commemoration of the Halyard Mission Rescue Operation being celebrated that year as part of the D-Day Anniversary ceremonies being held throughout the United States. We became instant friends and have stayed in touch ever since. At 84, he continues to share his memories and gratitude for what the Serbs did for the Americans behind enemy lines in Yugoslavia in 1944. He has never forgotten General Mihailovich or his Chetnik forces and is convinced that he would not have returned alive to America and a long and happy post-war life had it not been for the Serbs. 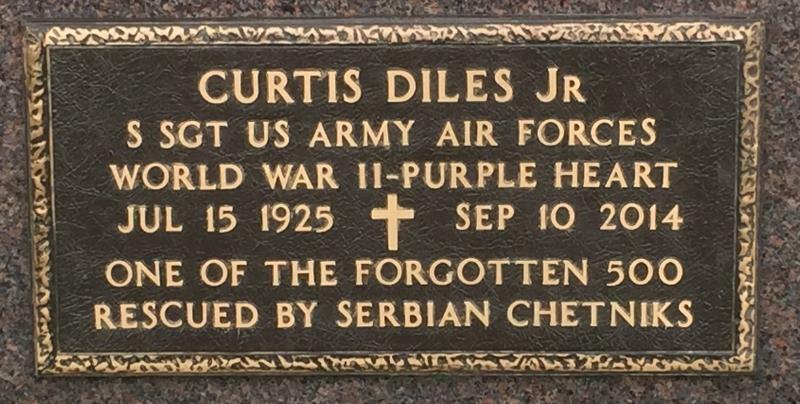 As with other rescued airmen I've had the privilege of becoming acquainted with over the years, I'm struck by how humble, stoic, and noble men such as Curtis Diles are. They truly exemplify everything that the American Armed Forces are supposed to be. My sincere gratitude goes out to Curtis "Bud" Diles for continuing to remain dedicated to spreading the word about General Mihailovich and the Halyard Mission through all these years. Thank You.